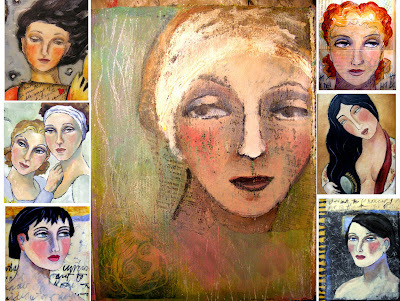 "Expressive Faces in Mixed Media" - one class I'll be teaching at Squam Art Workshops. 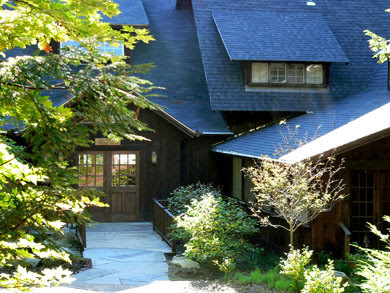 In September of this year I'll be teaching at a brand new venue in Holderness, New Hampshire. I met Elizabeth of Blue Poppy blog at Artfest several years ago and we made indelible impressions on each other. That was the first year I stayed in the dorm with private rooms; I remember glimpsing into Nina's room across the hall and seeing the netting and twinkle lights she'd hung around her window with a view of the water beyond. I would hear Nina's soft voice in the hallway as her friends greeted her, soft murmurings instantly recognizable. Elizabeth had the room next to mine; Carla was also in our area and we stayed up late one night exchanging stories. It was magic. 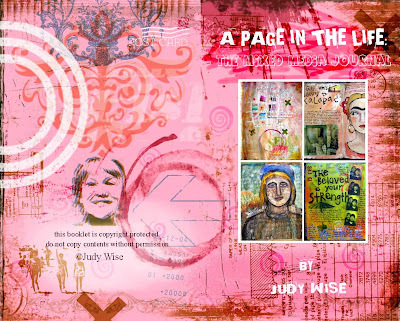 "A Page in the Life: the Mixed Media Journal" - this is the cover of the workbook handout for the other class I'll be teaching at Squam Art Workshops. Now Elizabeth has created this new event and happily has invited me to be one of the teachers there. I am in amazing company with Misty, Nina, and a host of well-known others including Grace Bonney of Design Sponge who will be giving our keynote address on Wednesday night. 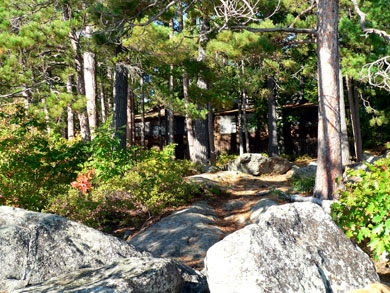 I've included some of the photographs of the Rockywold-Deephaven Camp for you to study. 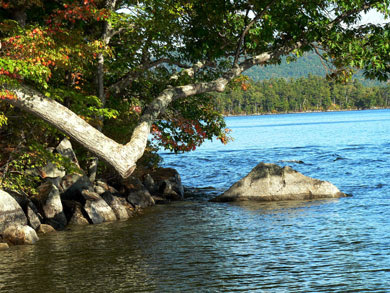 It looks to be a wonderful place to spend a few days at in September, don't you think? 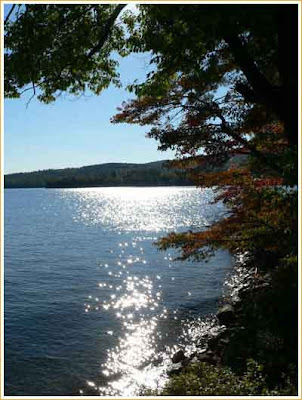 There'll be canoeing on the lake, wonderful meals, a carefree time to study with artists, writers, crafters and more. 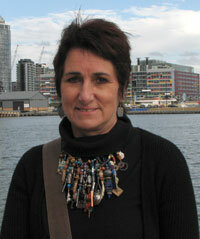 Andrea Scher, Penelope Dullaghan, so many of my blog heros will be teaching. It will be an amazing journey and I couldn't be more excited. This is my year of new discoveries; friendships, places, stretching myself further than ever before. If you feel like opening the door to new experiences and amazing networking, please consider joining me and the others. Now go here and check out the website and the terrific lineup of instructors. Tell me if it doesn't sound awesome. judy, judy, judy! i so want to come play at this event!!! i cant wait to see you soon (artfest). i needing a little bit of a judy fix! last night i said to jon, "i think i have to go to this." i don't see how i can't be there...it just looks like too much fun...oh the joy of it all!!! What a lovely location. How could anyone not create there. Wow, Judy! And fun to see the new teachers mixing it up... wish I could be there! Are there any groovy workshops in Florida? If you come I have a great place for you stay...I'll even figure out how to organize one here in Florida!! So beautiful, I am finding it so hard to be across the Atlantic from all the wonderful things that this group of people I admire and like so much are doing. Crazy sentence but hopefully you see what I mean. You vixen! You temptress! You wily minx!! 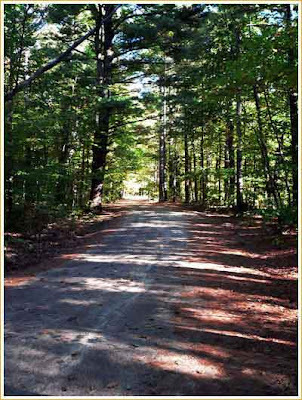 Not only summoning us with your presence as instructor (as if that wouldn't be enough), but also luscious tree-lined paths to glimmering sunlit lakes, and leading off with that mosaic of such beckoning, amazing painted faces. Will THOSE lovely women pictured also be attending? This sounds so amazing. I have always been afraid to go to something like this, but i am thinking it is time to get over that, lol..sounds like the perfect place to create some fabulous art. oh wow! this sounds so wonderful! 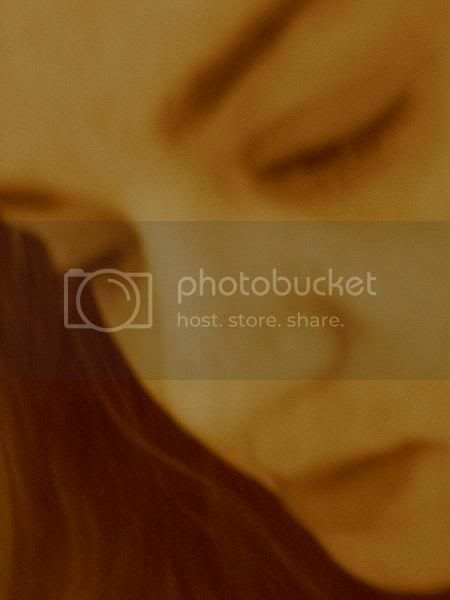 i really want to be there...i would love to take the expressive portraits class and meet such a wonderful soul as you. Judy, it's so beautiful, and so close, relatively, to where I live in Upstate NY. I think I might need to go there! I am looking forward to seeing you again at Artfest this year. It looks wonderful, but it's all the way across the world from me! I'm in SoCal, so I probably won't make it. Just wanted to let you know that I've given you the "You Make My Day" award. Stop by http://www.lantier.org for details. Oh, this is the exact class I've been looking for...I was waiting with baited breathe to see if it would be anywhere remotely close to the east coast...and yes. I am going to check this out. I love your work and I know this will be an amazing class. What a fabulous venue, so inspirational and Judy you are way up there with the others, I'm sure they feel special to be teaching with you. Looks like a wonderful class you'll be teaching, wish I could come. You'll get to meet our Judy soon I hear. yet another workshop I'll not be able to attend. I can feel that one of these days it will happen though. Saw the new Frida Khalo exhibit here at the Phila. Museum of Art yesterday. What amazing woman. Judy, I didn't get into your class at artfest - maybe so I can be in your class here! I am sending my form in soon! Hope to see you there. I am doing a little research, as I'm going to do a post today for Elizabeth, and ALSO teach in 2009! Hope you will be there next year! I wanted to set up on vendors night AND take a class from YOU...but we are tied to a wedding. BAH! 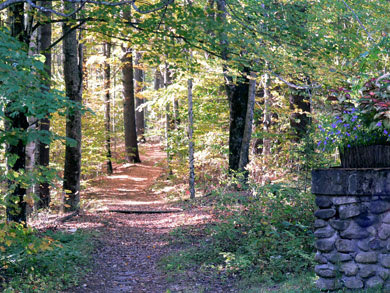 New Hampshire is gorgeous and I think the students will find the beautiful & natural setting inspiring!